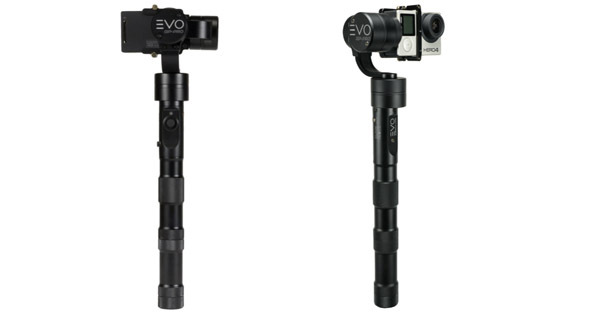 The American Gopro stabilizer manufacturer has done a very good job with its EVO GP PRO. In fact, if offers one of the best stabilization of the market and its reliability and quality make it one of the best you’ll be able to find. With its numerous advantages and its easy taking in hand, it’s about to please many people who will try it. Try it and you’ll adopt it. Here is our EVO GP PRO review in which we will try to look precisely into all the details you need to know about this Gopro gimbal. We will see our 6 usual criteria for a comprehensive EVO GP PRO review. As always, our first criterions of this EVO GP PRO review is the battery life. This test starts pretty well for this Gopro gimbal stabilizer. In fact, the battery life will last 5 hours according to the manufacturer’s information thanks to its 2000mAh double batteries. Directly, you know that this stabilizer is not planning to play in the child’s yard. As you could see in the other reviews we’ve done, there is not much Gopro gimbals which offer such a good battery life. As many Gopro stabilizers, such as the Zhiyun Evolution, the Feiyu G4S, Feiyu G5 or Ikan Fly X3 Go, to name but 4, you’ll be able to recharge your Gopro while in use. We used this functionality during our EVO GP PRO review. In the end, we managed to shoot during a bit more than 3 hours before the battery ran out of life. This is really good even though it’s not the best battery life we’ve seen among our numerous reviews. Note that, at the end of our EVO GP PRO review, the battery of our Gopro was fully charged. Therefore, if you want to optimize your running time for your Gopro gimbal, you’d better unplug the Gopro when your gimbal’s battery goes under 25% of battery. In order to know how much battery you have left, it’s very easy. There is a button which will blink in blue in order for you to know how much longer your session will be able to last. During our EVO GP PRO review, we managed to easily monitor the evolution of our battery life on our gimbal’s grip. If the button blinks 4 times, you have between 75 and 100% of battery. 3 times means you have between 50 and 75%. Logically, you’ve understood, if it blinks once, you have between 0 and 25% of battery life, and, this is at this moment that you should unplug your Gopro in order to optimize your gimbal’s battery life. We graded it with a 9.6/10 in our EVO GP PRO review. The next section of this EVO GP PRO review will be about the quality and reliability of this stabilizer. Well, here, our EVO GP PRO review is really positive. In fact, you just have to open the box to see the quality of this Gopro gimbal stabilizer. It really makes you confident and the materials which have been used to create this gimbal are very high-end materials. During our EVO GP PRO review, we were a bit surprised by its weight at the beginning, which is superior to the average of its competitors. 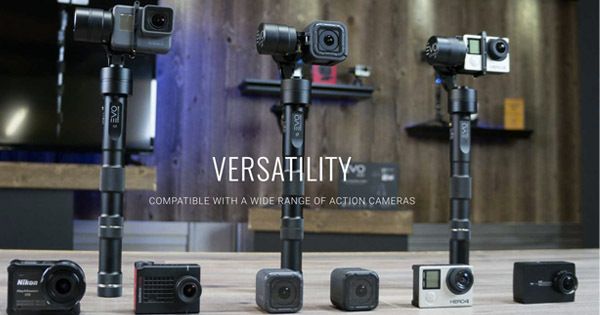 To discover all the competitor’s gimbals, do not hesitate to discover our Gopro gimbals comparison. Without the batteries, the gimbal is 335g/0.75 lbs. The quality has its price : the weight of the materials. The stabilization accuracy and the precision with which you can adjust the angle thanks to the joystick show, one more time, the very high quality of this gimbal that we present to you in this EVO GP PRO review. Furthermore, something really pleased us during our review, as we are really in love with the mountain. Indeed, the working temperature is just too impressive with this Gopro stabilizer. During our EVO GP PRO review, it was between 10 and 17°F and it worked perfectly. And this is normal as the working temperature is announced to be between 5 and 122°F. This is one more proof of the quality of this gimbal. Therefore, we graded it with a 9.3/10 in our EVO GP PRO review. As always, in order not to deteriorate your motors, DO NOT switch your motors on as long as your Gopro is not fixed on your gimbal. Even if our EVO GP PRO review showed a very good quality for this product, it won’t enjoy being brutalized. We always remind you of that because, when you’ll receive this gimbal, you will be too excited, maybe, to think about the important procedures. In the next section of our EVO GP PRO review, we’ll look into the quality of the stabilization produced by its 3 brushless motors. Here we are, already at the third criterion of our EVO GP PRO review. As every person who’s looking for a Gopro stabilizer, you obviously care about the quality of the stabilization in order to get rid of every vibration in your videos. If we graded it with a 9.5/10 in our EVO GP PRO review, you can trust us, the quality of the stabilization is very impressive. As a matter of fact, there is only one stabilizer which has a better stabilization, for the time being : the Removu S1. Of course, the other stabilizers also yielded very pleasant results, but we were not as satisfied as with this one. The vibrations you had been use to are now a thing of the past. Here, with the EVO GP PRO, the story is just awesome. If fact, the stabilization is really close to perfection. There is nothing to say about it in this EVO GP PRO review and we could have given a grade even closer to 10/10. The only reason for which we stuck to our 9.5/10 grade is that there was some very little bugs once during our test. The motors, because of the very cold temperatures (very close to the minimal temperature limit) sometimes reacted strangely. After a very long slope, the stabilization was not perfectly balanced anymore. Yet, this was very insignificant, but we still have to try to find it a few weaknesses… It is really a small detail but we wanted to address it during this EVO GP PRO review. In order to fix it, we just had to switch off and on our gimbal and everything was back to normal. In the end, we were very pleased by the work of these 3 brushless motors which make this Gopro gimbal work perfectly. EVO wins a lot of points in this section and you’ll struggle to find a better stabilization. The manufacturer also offers a very nice solution as long as smartphone stabilizers are concerned with the EVO SP-PRO. Indeed, the quality is really promising and, as for this one, you won’t be disappointed. In the next section of this EVO GP PRO review will be about the functions of this stabilizer. Let’s start this section of our EVO GP PRO review with the positive point. As you can see on the picture just above, this gimbal stabilizer will work with several action cameras and Gopros. In fact, it will perfectly fit different sizes of camera, be it a Hero 5 Black or Session. But that’s not all, in fact, you can also mount a Nikon Keymission 170, a Garmin Virb Ultra 30 or a Yi Action cam, Yi 4K Action Cam and SJ4000-SJ6000. Well, as far as versatility is concerned, our EVO GP PRO review is really positive. As far as the functions are concerned, we really see that EVO wanted to focus on what’s essential : the quality of the stabilization for perfect smooth and stabilized videos. Therefore, there is not much functions with this stabilizer as you could find with other competitors’ gimbals. Still, we would have enjoyed having a few more functions, as, for instance, the remote control via the mobile application. In the end, our grade for this section of our EVO GP PRO review is 7/10 for this criterions. When it comes to the different modes, you’ll have the choice between 3. When you switch your gimbal on, the default mode is the one which will always keep the horizon at the same level, no matter what you do. If you hit once the 5 ways joystick, you’ll lock your camera in one direction. No matter what move you do, the 3 motors will compensate them in order to keep your target in view. The third mode is the one we enjoyed the most during our EVO GP PRO review. By hitting twice the joystick, you’ll get into the following mode. Concretely, that will enable you to perfectly follow your target and your gimbal will do smooth moves to head into the good direction. If, for instance, you are doing action sport, like skiing, this is definitely the mode you should use. This is by far the one we used the most during our EVO GP PRO review. 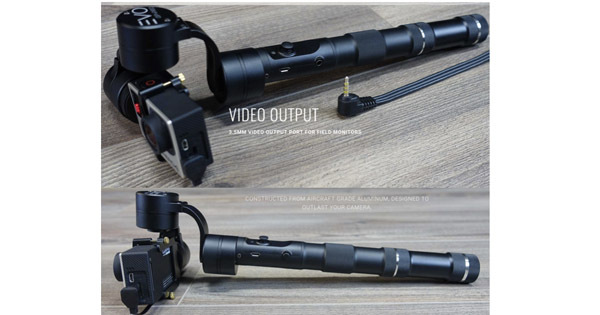 It is also interesting to note that you can connect a 3.5mm cable in order to have a live feed of what you are shooting with your Gopro. You’ll just have to plug your mobile or tablet to your gimbal, and your Gopro thanks to the charger cable, and the job is done. Still, even though this function may be interesting during “quiet and relax” videos, we don’t think it is convenient to use it for moving videos like when you are skiing for instance. The stabilization of subject of our EVO GP PRO review has been the main think the manufacturer cared about, apparently. Every obsolete functions have not been added to this gimbal. In the next section of our EVO GP PRO review, we’ll look into the taking in hand and the controlling of your gimbal. In this section of our EVO GP PRO review, we’ll look into the taking in hand and controlling. This is a very good section for this stabilizer. Indeed, the taking in hand is really good thanks to its long enough grip, for once ! Our grade is 9/10 for this criterion of our EVO GP PRO review thanks to that real strength mainly. Contrary to almost all other competitors’ grip (except the Zhiyun Evolution), this one hast just the size we wanted. Not too long, not too short, this is just perfect. There is no risk you might hit accidentally the buttons while you’re using it. The distance between your hand and the joystick is really long enough. During our EVO GP PRO review, we were also very pleased by the simplicity of the controlling. Connecting your Gopro is a real child’s play and will only take a few seconds. As we already said in this EVO GP PRO review, the quality of this gimbal stabilizer is really convincing when you take into account the grip. The latter is only made up of 2 buttons for a very easy use and controlling. In order to switch your gimbal ON, you just have to hit the little grey button on the right of your grip. In order to switch ON the motors, a simple press on the joystick for approximately 1s will do the job. It is this one you’ll have to use to switch from one mode to the other, as we already explained in the previous section of this EVO GP PRO review. Once the motors are switched ON, you just have to start recording your videos. Be careful, it is highly recommended to switch on your video before you switch on the motors. Indeed, if you try to start the video after, you’ll have to touch your Gopro, and this may deteriorate the functioning and balancing of your motors that would have to “fight” against you. If we did not give it a better grade than 9/10 in our EVO GP PRO review, it’s because we would have enjoyed controlling a few more things. In fact, the lack of mobile application is a bit disappointing, compared, for instance, with the Feiyu Summon+ or the Feiyu G5. Yet, you could connect a remote but, honestly, a cabled remote is quite useless according to us. Without wasting any more second, discover the conclusion of this EVO GP PRO review with the price of the product. Here is the section of our EVO GP PRO review many of you have certainly been waiting for. The price of this Gopro gimbal stabilizer is a little bit above the average of the competitors’ gimbals price. 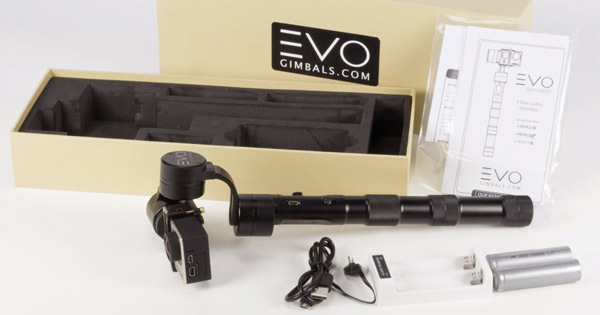 If you want to buy the EVO GP PRO, you’ll currently have to pay 349$, which is quite expensive, and, almost as expensive as the #1 of our ranking, the Removu S1 gimbal. Still, you really understand where your money goes. Indeed, the quality and reliability of the product were very convincing. There is nothing bad to say about it and we honestly think it’s almost a fair price when you see the outcome. Below, we’ve made a very short summary of the strengths and weaknesses we put forward during this EVO GP PRO review. Pros : The battery life, the very good taking in hand and easy controlling, the almost perfect stabilization and the very good quality and reliability of the gimbal. Cons : The price, the very limited functions and the lack of mobile application. As you’ve seen all along in this EVO GP PRO review, we were really pleased with the performances of this Gopro gimbal stabilizer. It really offers a good user experience and we almost have anything bad to say about it. Let alone its price and little lack of functions, it is really one of the best stabilizer you could find for your Gopro.